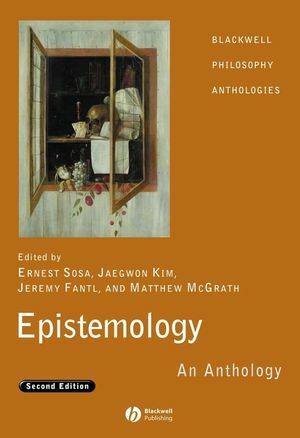 New and thoroughly updated, Epistemology: An Anthology continues to represent the most comprehensive and authoritative collection of canonical readings in the theory of knowledge. Ernest Sosa is Professor of Philosophy at Rutgers University. He is the author of Knowledge in Perspective (1991) and A Virtue Epistemology (2007), and co-editor (with John Greco) of The Blackwell Guide to Epistemology (1999) and other texts. Jaegwon Kim has taught at Cornell University, Johns Hopkins University, and the University of Michigan. He is currently the William Perry Faunce Professor of Philosophy at Brown University. He has authored and edited several philosophical texts, including Supervenience and the Mind (1993) and Physicalism, or Something Near Enough (2005). Jeremy Fantl is Assistant Professor of Philosophy at the University of Calgary. He and Matthew McGrath are writing a book entitled Pragmatic Encroachment in Epistemology. Matthew McGrath is Associate Professor of Philosophy at the University of Missouri-Columbia. He is the author of Between Deflationism and the Correspondence Theory (2000) and is co-authoring Pragmatic Encroachment in Epistemology with Jeremy Fantl. 1. The Problem of the External World: Barry Stroud. 2. Proof of an External World: G. E. Moore. 3. Four Forms of Scepticism: G. E. Moore. 4. Certainty: G. E. Moore. 5. How a Pyrrhonian Skeptic Might Respond to Academic Skepticism: Peter Klein. 6. Epistemological Realism: Michael Williams. Part II: The Structure of Knowledge and Justification:. 7. The Myth of the Given: Roderick M. Chisholm. 8. Does Empirical Knowledge Have a Foundation? : Wilfrid Sellars. 9. Epistemic Principles: Wilfrid Sellars. 10. Can Empirical Knowledge Have a Foundation? : Laurence BonJour. 11. A Coherence Theory of Truth and Knowledge: Donald Davidson. 12. A Foundherentist Theory of Empirical Justification: Susan Haack. 13. The Raft and the Pyramid: Ernest Sosa. 14. Human Knowledge and the Infinite Regress of Reasons: Peter Klein. 15. Is Justified True Belief Knowledge? : Edmund Gettier. 16. Thought, Selections: Gilbert Harman. 17. The Inescapability of Gettier Problems: Linda Zagzebski. 18. A State of Mind: Timothy Williamson. 19. Epistemic Operators: Fred Dretske. 20. Relevant Alternatives and Deductive Closure: Gail Stine. 21. Knowledge and Skepticism: Robert Nozick. 22. How to Defeat Opposition to Moore: Ernest Sosa. 23. Are There Counterexamples to the Closure Principle? : Jonathan Vogel. Part V: Theories of Epistemic Justification:. 24. Evidentialism: Richard Feldman and Earl Conee. 25. Skepticism and Rationality: Richard Foley. 26. What is Justified Belief? : Alvin I. Goldman. 27. Reliabilism Leveled: Jonathan Vogel. 28. Externalist Theories of Justification: Laurence BonJour. 29. Internalism Exposed: Alvin Goldman. 30. Externalism and Skepticism: Richard Fumerton. 31. Internalism Defended: Richard Feldman and Earl Conee. Part VI: Virtue Epistemology and the Value of Knowledge:. 32. Warrant: A First Approximation: Alvin Plantinga. 33. Virtues of the Mind, Selections: Linda Zagzebski. 34. Virtues and Vices of Virtue Epistemology: John Greco. 35. Cognitive Responsibility and the Epistemic Virtues: Duncan Pritchard. 36. The Place of Truth in Epistemology: Ernest Sosa. 37. Why Should Enquiring Minds Want to Know? Meno Problems and Epistemological Axiology: Jonathan L. Kvanvig. 38. True Enough: Catherine Z. Elgin. Part VII: Naturalized Epistemology and the A Priori:. 39. Epistemology Naturalized: W. V. Quine. 40. What is “Naturalized Epistemology”? : Jaegwon Kim. 41. Quine as Feminist: the Radical Import of Naturalized Epistemology: Louise M. Antony. 42. There is at Least One A Priori Truth: Hilary Putnam. 43. Revisability, Reliabilism, and A Priori Knowledge: Albert Casullo. 44. A Priori Knowledge and the Scope of Philosophy: George Bealer. 45. Normativity and Epistemic Intuitions: Jonathan M. Weinberg, Shaun Nichols, and Stephen Stich. 46. Normativity and Natural Knowledge: Hilary Kornblith. Part VIII: Knowledge and the Pragmatic:. 47. Solving the Skeptical Problem: Keith DeRose. 48. Elusive Knowledge: David Lewis. 49. Contextualist Solutions to Epistemological Problems: Scepticism, Gettier, and the Lottery: Stewart Cohen. 50. Knowledge and Practical Interest, Selections: Jason Stanley. 51. Evidence, Pragmatics, and Justification: Jeremy Fantl and Matthew McGrath. 52. Sensitive Moderate Invariantism: John Hawthorne. 53. The Assessment-Sensitivity of Knowledge Attributions: John MacFarlane. Part IX: Testimony, Memory, and Perception:. 54. Trust and Rationality: Judith Baker. 55. Against Gullibility: Elizabeth Fricker. 56. Content Preservation: Tyler Burge. 57. Testimonial Knowledge and Transmission: Jennifer Lackey. 58. The Problem of Memory Knowledge: Michael Huemer. 59. Criteria, Defeasibility, and Knowledge: John McDowell. 60. Knowing How to Believe With Justification” Steven L. Reynolds.